I've been reading a delightful and insightful book called "Sitting at the Feet of Rabbi Jesus" by Ann Spangler and Lois Tverberg. (If you want to know more, see their site.) They suggest getting a haver, or friend. 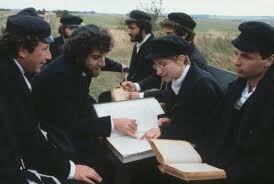 The way they described it made me think of study partners as seen in the movie, Yentl. Like for the scriptural discussions and debate. I like this idea and have prayed for someone to be my study partner now. I had a friend like this once, but she moved away and started a family years ago. Our contact is infrequent now. But when we saw each other every day, we almost always had insights to share with one another. We prayed together, we had many enlightened moments, and it was very uplifting to have a friend like that. While I look for a study friend, I found myself talking to God this morning as I read the first chapter of Acts in an interlinear Greek-English New Testament. And I figured He could be my haver for now, the best one anyone could have. Me! Email me. I would LOVE to study with you.